NOTE: The following links provide further information on the appearances of Mary, Queen of Heaven, to three shepherd children at Fatima, Portugal in 1917. 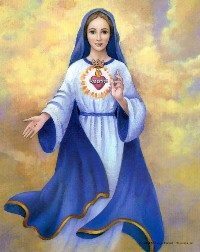 Through these apparitions, Our Lady requested the worldwide consecration of Russia to Her Immaculate Heart, so as to avoid an annihilation of nations in order to bring about Her Triumph in the world and a great Era of Peace granted by God. On October 13, 1917, a great Miracle–the “Dance of the Sun”–was performed by God and witnessed by over 70,000 people, to confirm the validity of the heavenly messages. Unfortunately, the consecration of Russia by the pope in union with all the bishops of the Catholic Church has not taken place to the satisfaction of Heaven, while much of the wars, sufferings, and horrible deaths of the past century could have been avoided.